A relative man among boys each of the last two seasons, and this year he helped to make even more school history. San Bernardino Indian Springs senior Titus Nickson is InlandFieldhouse.com’s 2016 Boys Soccer Player Of The Year. Nickson, the Inland Area’s most impressive defender over his last 50 games, led the Coyotes to their first San Andreas League title and first CIF-Southern Section playoff victory this season. Indian Springs senior Titus Nickson was MVP of the 2014 San Gorgonio Shootout. 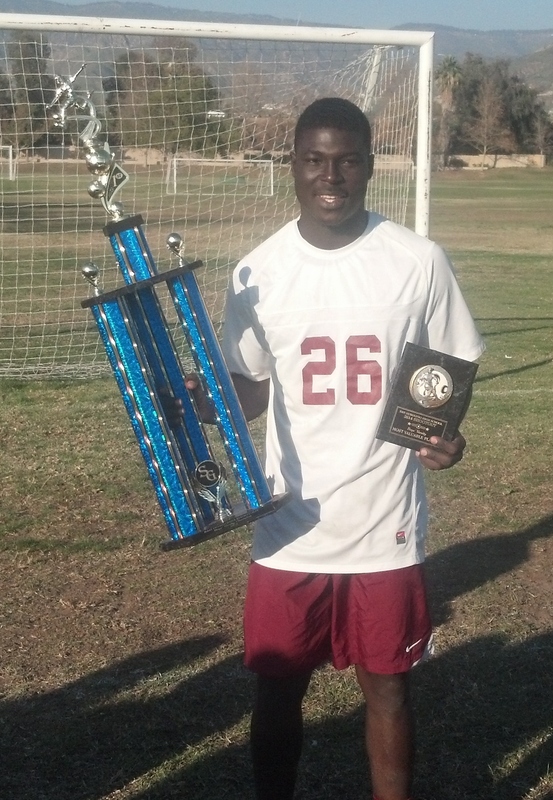 The 6-foot-2 Nigerian-born center back first made an impression during the 2014 San Gorgonio Shootout, winning tournament MVP after scoring goals in the quarterfinal and semifinal rounds en route to Indian Springs’ first trophy as a soccer program. His calm yet massive presence on the ball was the difference for Indian Springs’ playoff push this season. “He was a major force in the back, but in the last few games he stepped it up to a whole new level of intensity and attacking anybody who came into his area to the point where it was almost impossible to go around him,” Indian Springs head coach John Arient said. Nickson said his favorite memory from this senior season was coming from 2-0 down to draw, 2-2, at Rialto in a SAL game on Feb. 4. The result kept the Coyotes’ title hopes alive. The Coyotes (14-6-5 overall, 6-1-3 league) wrapped up their first SAL title a week later, claiming a spot in the CIF-SS Division 5 playoff draw. The team took points from of their final nine league games, then defeated Pomona, 2-0, in their first ever home playoff game. Nominated by Arient for the Inland Empire High School All-Star Game, Nickson was the only field player to stay on for all 80 minutes. His San Bernardino County team lost, 3-1, to Riverside County on Friday, March 18, 2016. College is weighing on his mind. Nickson graduate with his class in June, then decide on his next step, which he said will definitely include soccer. “Because he only came to the Unites States a year and a half ago recruiting is kind of new (but) his ceiling to where is potential could be is off the charts,” added Arient. A natural defender versatile enough to also play on the wing, Nickson will make an immediate impact at the next level, no matter where that is. “I watch the game. I read the game. I try to put people in position to make the game easier for the whole team,” Nickson said. A man among boys? Maybe not for long. But clearly mature beyond his years.